5 Online Russian Keyboards to Type Russian Easily - 5FOUND ! Suppose you are learning Russian and you need to type Russian on your computer but you are not ready to install a Russian keyboard, or you are travelling abroad using an Internet café computer. Well, you may consider an online |Russian keyboard, which will let you to type Russian characters on computers that do not have a keyboard for typing the Cyrillic alphabet. Below are 5 online keyboards for you to do that. Apronus allows you to type Russian online by either clicking on its virtual Russian keyboard or typing using your own keyboard. You can switch between your real keyboard and the online keyboard by checking or unchecking the “Russian Keyboard”. You can then copy your text to the place you want or you can output the text as PDF format in case the text will not display properly. 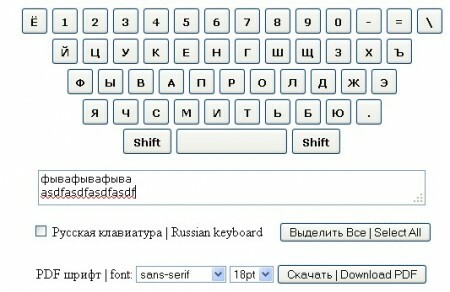 Winrus offers a virtual Cyrillic keyboard that allows you to type Russian and Ukrainian online with both standard layouts and phonetic (homophonic) layouts. You can choose a layout that you use at home so you can type easily and if your keyboard is not in the mode of “US English”, you can choose from others like German, Swedish, French, Italian, Spanish etc. Branah offers a virtual Russian keyboard that enables you to easily type Russian online without installing Russian keyboard. It works the same as other online Russian keyboards. You can either use your computer keyboard to type directly or click the keyboard on the page using your mouse. 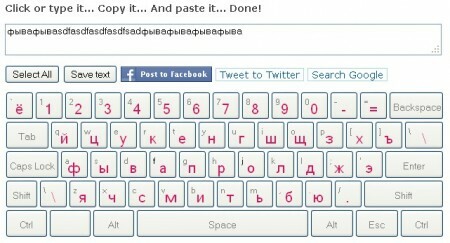 You can shift between virtual QWERTY keyboard and virtual Russian keyboard by clicking the Esc key. You can save the text or post it to Facebook or Twitter after typing. Gate2home allows you type Russian online either by clicking on the virtual keyboard with your mouse or using your real keyboard. No matter you are now with a QWERTY keyboard or an AZERTY keyboard, you can type easily using your own keyboard. After typing, you can copy your text and save it or you can tweet it or post it on Facebook.